Where do you go when needing to be reminded of who you are, and whose you are? For several years, I have continuously been drawn to the prophet Jeremiah. His call, his painful wrestle to walk it out, his rawness before the One who called him- I revisit his portion of pages in my favorite Book often. This morning I awoke early and restless, as if my soul’s desperation for a comforting word propelled my physical body from sleep. I put on some music and returned again to the trials of Jeremiah, retracing steps taken countless times before. Circling around words in efforts to pin them down for a closer look- a fresh perspective- I read and read again, Jeremiah chapter 20, Lamentations chapter 3… It doesn’t take much time with said prophet to surmise a life lived of painful obedience, physically, but also very much emotionally. And with pain comes doubt- doubt in our calling, maybe even doubt in our Caller. So why am I here- why these pages, Lord, why this weeping prophet? I’m seeking clarity, not more doubt. Immediately a thought I love from Benjamin Franklin runs through my mind- Tell me and I forget, teach me and I may remember, involve me and I learn. Okay, God. Okay. Help me learn. Make it clear, and give me resolve when it’s not. Help me see what carried Jeremiah through. Thank you for loving and using him and all the uncertainty, questioning and anger over the pain that came with him. And thank you for ensuring Jeremiah’s earthly struggles and devotion to You were recorded on parchment so all these generations later, I may know a friend. and personal, not mechanical and institutional. Faith invades the muddle; it does not eliminate it. Peace develops in the midst of chaos. Harmony is achieved slowly, quietly, unobtrusively-like the effects of salt and light. Such clarities result from a courageous commitment to God, not from controlling or being controlled by others. Such clarities come from adventuring deep into the mysteries of God’s will and love, not by cautiously managing and moralizing in ways that minimize risk and guarantee self-importance. Twelve years ago these bubblegum shoes, along with my very pregnant, hospital-gowned self, waddled the halls of a Nashville maternity ward in effort to distract while encouraging the inevitable birthing process to hurry up and get a move on. I remember laughing- half amused, half embarrassed- over the spectacle of my pink sneaker/open-in-the-back-gown combo, hoping aloud no one I knew happened upon me in such a state. Arm in arm with Rob and heart to heart with our very soon to be born baby girl, the pink shoes and I took our last stroll ever, before entering the long painful night of labor and emerging in the early pre-dawn hours a mother. Through all the years- the writing of your little life- these shoes remain. I haven’t been able to let them go, so there in the corners of closets and underneath piles of clothes they have sat in wait. With every new house, new sibling, new city, new adventure, I’ve packed them up and brought them along, but never really wearing them again since you joined us those twelve springs ago. In a recent cleaning frenzy, they caught my eye and I realized in a wave of nostalgia and sudden ache- you now wear the same size as my labor shoes. At the time of the closet purge those weeks ago, I made a mental note to save them for today, your birthday- a sentimental gesture I realize speaking more to the giver’s soul than receiver’s- especially because I know, pink is not your color. At the time- I didn’t give much thought to it all. But in the weeks since, the shoes, and the birthing pains keep showing up. 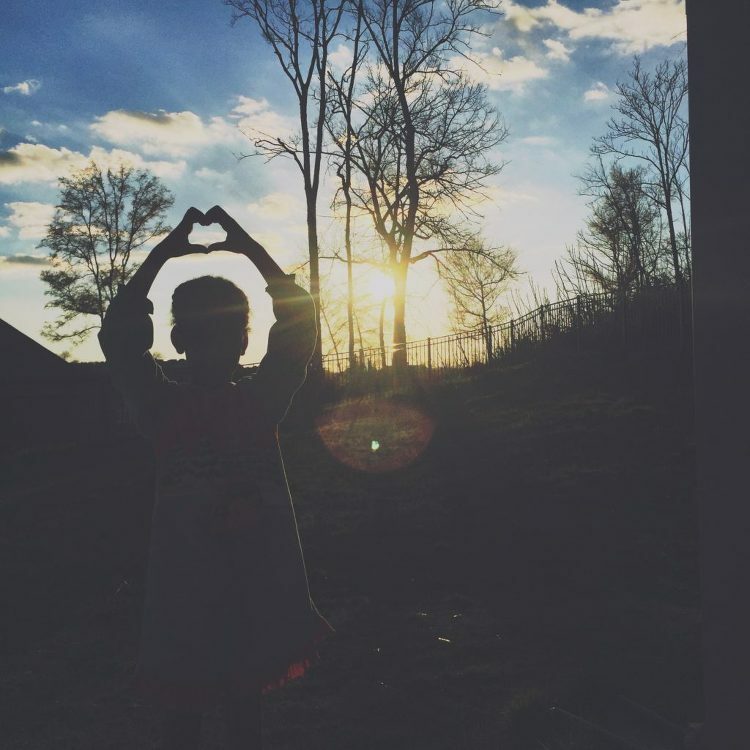 There in the new growing tension between mother and daughter, there in my desperate prayers for wisdom, there through the tears over watching you hurt, God began to show me new layers to this chapter of your life. There is a building intensity of labor pains you are now experiencing as you must walk the corridor from girlhood into womanhood. Walking those hospital halls twelve years ago was scary to me, but more than the fear, there was joy. At that point I was already feeling the pains of bringing you into the world, but I bore them happily just to have you here. Today, these shoes no longer fit me- they fit you– and today I can no longer bear the wrath of your pain as you labor through your own long night into growing up. There aren’t words to appropriately describe the dense weightiness my heart feels in the wishing I could shield you from the hurt of these contractions. But I also know that I know, that I know, after the pain of the night- joy comes in the morning. You came in the morning- 4:05am March 22nd, 2005- JOY came in the morning and was all the fuller on the heels of my great birthing pains. 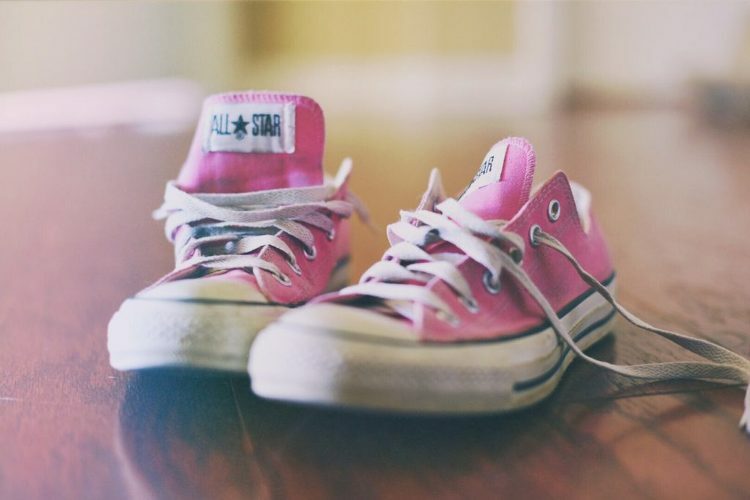 So while I don’t expect to see you walking any halls in my old pink Chucks anytime soon, I do hope their story reminds you of your own, and that no matter the labor pains that come in your life, you can walk them out. You are walking it out now, with more beauty and bravery in your twelve years than I’ve ever known in my nearly 40. Whatever shoes you choose, keep walking baby girl, this world needs you and as much as I may selfishly want to, I can’t hold you back for my own any longer. This weekend marks the one-year anniversary of our move from Wondergrove to Knoxville, and I am sitting here in one of my favorite spots in the house thinking how much life has played out in only 52 weeks. Weeks that have stretched me, exposed my vulnerabilities, and pushed me to walk outside of my personal zone of comfort. These have been days of adventure mixed with mundane, times of tears and also deep side-aching laughter, moments of doubt amongst waves of purpose and calling. It has been everything I imagined it would be, and yet nothing I could have ever expected. And isn’t that just life? Here’s to the next 52. This weekend I experienced what can only be described as a remarkable gift, one I don’t expect to ever forget. In God’s tenderness, I found myself a few states away, in a room of female writers, teachers and speakers, sitting under and gleaning from one of the great mentors of my personal walk with Jesus. By the time I left Houston on Sunday I was completely undone and filled high and full all at the same time. As I slowly process through the knowledge and exhortation passed down the sweet cord of discipleship, I find myself steeping in certain moments and impressions. One in particular struck deep, and God has been using it to work on me- righting some wayward thinking, cutting at areas of cancerous pride in my life. My hope is in my conviction and under the flood of grace I was washed in this weekend, to record some of the unfolding as an encouragement to you, while furthering the engraving of it all on my soul. Saturday morning as I filed into a hotel ballroom seeking out a good seat amongst 700 other eager attendees before the opening session began, I noticed there on the front row stood one of my favorite authors. I was surprised, as she had not been promoted as appearing in any of the event literature, but there she was, flanked by other powerhouse teachers and speakers. All day, throughout the sessions she was there, but even as all the other leaders one by one took to the stage, she never did. She was actively participating, but in a role of receiving versus serving, just as the rest of the us filling the packed ballroom. Never taking the platform nor uttering a word into a microphone, the silent presence of one of the most compelling voices of our day, spoke volumes to me. And I can’t help but be reminded- just because the world has given us a place on the stage, doesn’t mean we always need to use it. Sometimes our quiet obedience and humble surrender from within the audience impacts deeper and far wider than anything our mouths could conjure. Sometimes there is fuel for our next moment on a stage that can only be gleaned from a still, quiet place in the crowd. Without interjecting any assumptions as to the reasoning behind this particular writer’s silence, God used the scene to speak to me. From where I observed, this woman whom I so admire, was humble enough to be poured into and rest there from her seat. Truly, I love her all the more for her example and pray her soul is as refreshed as mine is today. Regardless of any accolades and cultural benchmarks attained, we all hit times along our journey of desperate need for refueling and fresh passion. From New York Times Best Selling authors, to the preschool Sunday school teacher, the homeschool mom or the PTA president- we cannot serve God in a vacuum of self-sufficiency. I can only give away to others from the overflow in my life, meaning there has to be life flowing in or I am just pouring out from my own stubborn will in the name of Jesus- and for real, no one needs a drink of that. I am honestly not at all sure where my writing journey may lead- it could stay here where it’s always been- mostly in the safe pages of journals and letters to friends, or God may call from down a new path. Either way I pray obedience will be my response. For now, I am learning new levels of gratitude for times to set the pen down and listen to God speak through other writers, teachers of the faith, and wise friends. My prayer today is whatever platform you have been given, may you experience space as needed to regroup, and more importantly the humility to know when to step down, take a seat, rest and receive.